The Office of the Premier, KZN, shared a book stand with Dancing Pencils at the Annual Conference of the Department of Arts and Culture. All major publishers were represented in an elegantly organized function. Booksellers were also present and seating arranged at the other side of the hall for book launches that took place later that morning when Ms Thizani Dlungwani, Deputy Manager, Premier’s Priority Projects, launched new district anthologies with stories written by children in deep rural areas. 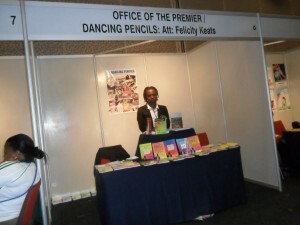 Ndiphile Gule was in charge of the Dancing Pencils book stand and is photographed here. Felicity attended Plenary speeches in the adjacent hall. She was impressed with Professor Buthelezi’s speech which did emphasize the part that Words play in our lives and the important role that authors have in society. A final social evening at the BAT Centre where the bay sparkled with reflected lights and the water twinkled was a great ending. Seeing so many librarians that have been in our lives was wonderful! Thank you, Department of Arts, Culture, Recreation and Sports! Ms Thizani Dlungwana, Deputy Director, Premier’s Priority Projects, was at the Arts and Culture Language Conference at the ICC on the 21st of November to launch 18 Educational District’s new anthologies of stories. 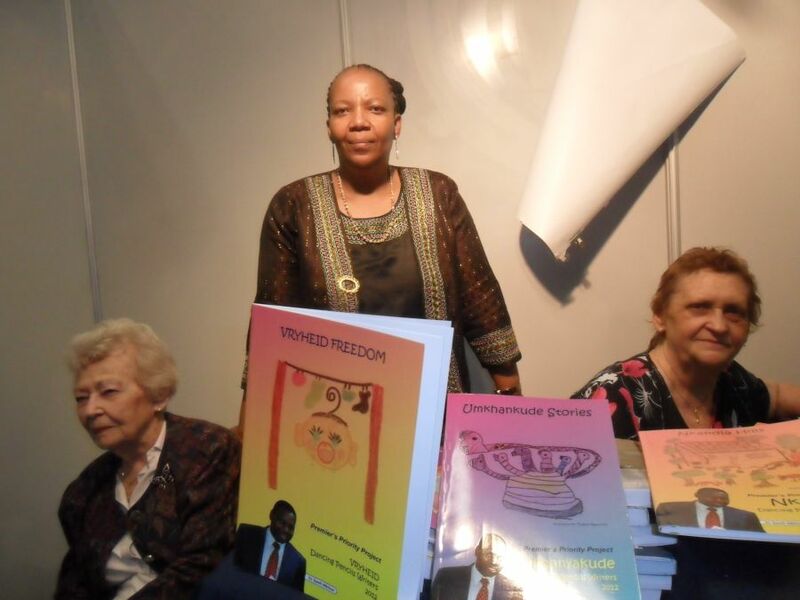 These stories have been written by children, in English and in isiZulu, in many deep rural areas that include Umkhanyakude, Dumbe, Ezinqoleni, Nkandla, Empangeni, Bergville, Umzumbe, Gamalakhe, Vryheid, Ladysmith and many others. This has been the culmination of a year of hard work done by the Office of the Premier and the Dancing Pencils teaching and book selection and editing teams. After the launch of the books by Thizani, there was a deluge of people at the book stand called “Office of the Premier/Dancing Pencils” as they created huge interest.